You’re right. Pretty to begin with, the white edging finishes them off nicely. 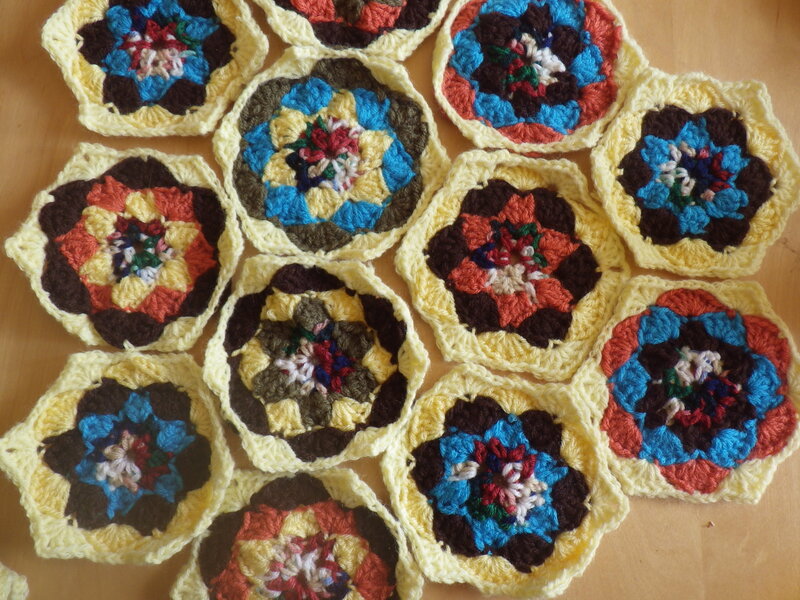 What happens once someone has sewn them together as a lap blanket, an online charity auction perhaps? We are planning to have a raffle – an auction was suggested, but I vetoed it. I really don’t like the idea that only affluent people would have the chance of winning one of the blankets, a raffle seems much fairer – if you can only afford £1, you still might end up with a lovely hand-crafted object. A miracle from ‘unconsidered trifles’ as Shakespeare calls them… Everything that has been made with love has a use, and I like the use to which you’re putting these. I think they are going to make a rather lovely finished lap blanket… and anyway, I didn’t have enough crocheting to keep me busy! Thousands of these quilts were donated to charities after the event, so I imagine quite a few people were a warmer in the winter of 2011! It’s funny isn’t it, how a different pair of eyes can see a whole new perspective? It’s going to be lovely when it’s done – thank you!